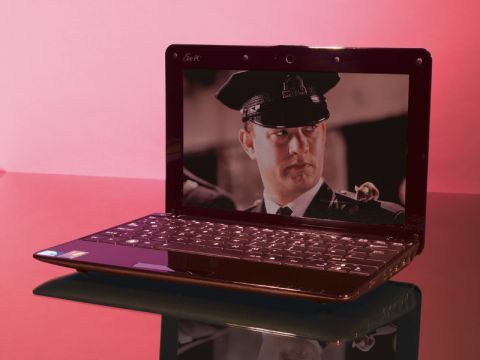 Does yet another Eee PC do the brand proud? When Asus' original Eee PC Seashell 1008HA appeared, we were bowled over by the machine's incredible size and usability. Asus has now created an even more portable model, by producing the 1005HA which features a slightly bulkier chassis, but also a better 6-cell battery. In our opinion, the extra size has been worth it. The new battery provides 357 minutes of life, meaning true all-day usability. The machine is built from shiny – yet durable – black plastics, that attract fingerprints and smears instantly. It is a little chunkier than its predecessor, but at 1.3kg adds only minor extra weight to the original Seashell, and is no heavier than the majority of other netbooks available. The 10-inch screen is good, providing detailed and bright images. One thing we did notice is that the screen doesn't open up much past 90 degrees to the chassis, meaning it was sometimes difficult to achieve a comfortable viewing angle. The keyboard stretches the width of the chassis and is well mounted. The keys do rattle a little noisily as you strike them, but this is the only issue in what is otherwise a very comfortable user experience. The touchpad boasts a mottled surface which feels great to touch and always proves responsive. The 160GB hard drive provides plenty of space for your files and folders, and Asus has also included 10GB of online storage where you can keep your most valuable files and data for safe-keeping, in case anything should happen to your netbook. The integrated 802.11n Wi-Fi provides the fastest wireless connection to the internet currently available and 10/100 Ethernet is also included. Elsewhere, three USB ports provide room for peripherals, and a VGA-out for connecting to an external monitor rounds off the specifications. Despite the slightly larger chassis, the extra battery power offered by the Asus Eee PC Seashell 1005HA will certainly appeal to those after all-day usability from their netbook. This is a great product and one that offers a valid alternative to other 6-cell carrying machines.